In 1995, when I invited home a non-Brahmin friend, that too, a girl; I was breaking several rules of an orthodox mindset. When I walked along with my best friend on the street near my house in Surathkal (Near Mangalore), I recall many eyes, anxiously gleaming through the windows of their homes; perhaps they were judging us, or may be many stories originated in their creative minds. Even though I was the first, at home to do so, my parents did not object it; I would want to believe that they have understood friendship in a much broader way than the others of their own generation and not just being tolerant. Only few years later, there was a major riot due to a Hindu girl’s involvement with a Muslim boy; their personal matter was forcibly made public, followed by a major riot. Apparently I knew both of them but we, without any prior consulting, unanimously choose to ignore this event rather than scrutinizing it. I felt then and still feel that it is a personal choice of an individual of what he or she does with their lives. Their parents or responsible people in the family can guide them if need be; it does not require public attention. Today, as I see on news channels, video clips of the attacks on a pub in Mangalore; College going boys and girls being hit and tagged with ugly names by the attackers; it brings back these old memories. The attacker’s claim that their intention is to prevent bad western culture superseding ours and i very much appreciate their thoughts; but according to me this is simply not the way to execute their intentions. If an awareness of Indian traditions and culture has to be brought among youngsters, then inspire them; motivate them through cultural programs, talks and importance of our culture and tradition, not by instigating in them, fright. Fear has and will never bring a positive change; Hitler perhaps is a lesser example for them I guess. If one wants to sustain our traditions, let they initiate programs to uplift our life style, our folk arts, our culture. More initiation such as Alva’s Virasat, cultural programs, Yakshagana, awareness through Pravachana and talks are needed; not through mob attacks. And may media once in a while start presenting the better side of Mangalore such as recently held internationally acclaimed- Virasat (Cultural fest) and phenomenal achievements by Dharmasthala Veernedra Hegde. Three achievers hailing from Mangalore and Udupi are among the Padmashree awardees this year; Dr. B.R. Shetty (Founder & CEO of New Medical Centre Group of companies since 1975), Bollywood diva Aishwarya Rai Bachchan and Bannanje Govindacharya (Vedic scholar). Media should also learn to present some of these many good qualities of Mangalore apart from highlighting the name during attacks and tagging it as Mangalore Taliban. 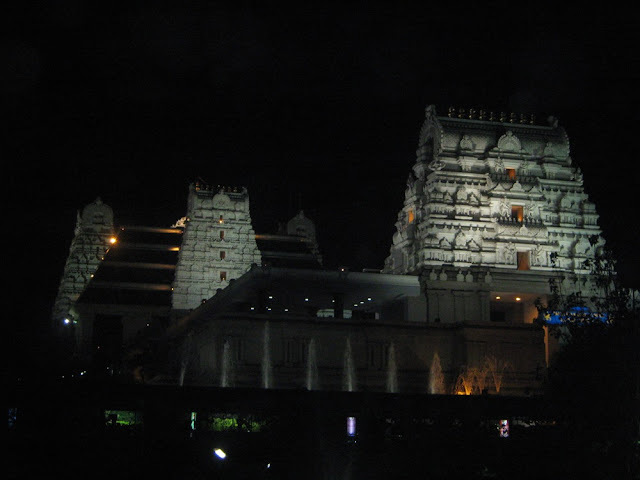 When P’s parents were here for 3 days, we traveled around the city; Shiva temple at Old airport road, ISKON, Raaghi Gudda temple. When my parents visited us, they were busy with the Vishwa Kota Sammelana (Conference of our community). At the conference we witnessed some excellent cultural programs. Bharathnatyam Dance by Mamtha Karanth (A distant relative of mine) and her students was very impressive. Eka Patra Abhinaya (Mono act) by well known Yakshagana artist Mantapa Prabhakar Upadyaya was very beautiful and it proved that Yakshagana is also very much a classical dance form. Few discussions were good, highlighting the importance of saving our traditions and culture. Popular Lion dance from a Yakshagana sequence was also an interesting watch. We also watched Ghajini. Having watched the Tamil first and liking Surya’s controlled performance; it was inevitable not to compare the two. Background music was excellent in Tamil and a little cold in the Hindi version. Even though Aamir has given his cent percent, according to me Surya is a much suitable actor for that role. Asin rocked in both versions. The strength of the film also is the characterization (Especially that of Asin) and the storyline. Though the Tamil ending was overlong and filled with action, Hindi wasn’t any better and the villain and hero kept running in some Jantar Mantar kind of maze. When we were at Mangalore for New Year, we visited some of our relatives; went to the beach or otherwise relaxed at home. Three day musical concert at Ramakrishna Ashram, near my house took us on a very peaceful journey. May it be Rajan & Saajan’s Hindustani music, Kadri Gopalnath’s Saxophone music or Pandit Hariprasad Chaurasia magic with flute; they were all soulful and created a serene atmosphere. This post is a result of a slogan I saw behind a car, it said – Worship the creator, not the creation. I think the car was a red colored Zen, as in that short glimpse; the attention over the slogan overtook the model of the car. It was a private vehicle, perhaps the driver was an educated guy. I looked at my own living style and I realized that I worshiped Creator and his creation. So was his slogan referring to me? Trying to taunt at me? Perhaps, it was, to people like me. In my 28 years of being, I have worshiped the creation, along with the creator but I was never told that it is the only way to live. I did not even notice that there were communities who worshipped only the creator. My parents or priests never degraded others way of life instead they made sure to inbuilt a behavior in me to respect the nature. Let me give some examples that happened to me in the recent days which helped me collectively arrive at a conclusion for this practice. Previous month I watched a Yakshagana program (Field Drama, a folk art of South Karnataka region). It was performed on the title “Govardana Giri” from Mahabharata. In which Krishna, to remind Indra (King of Heaven) his duties, rejects the prayers and sacrifice offered to him and instead asks his disciples to offer prayers to the Govardana Mountain, which is a shelter for several medicinal herbs, water source and provide food to the cows which in turn provide us milk. 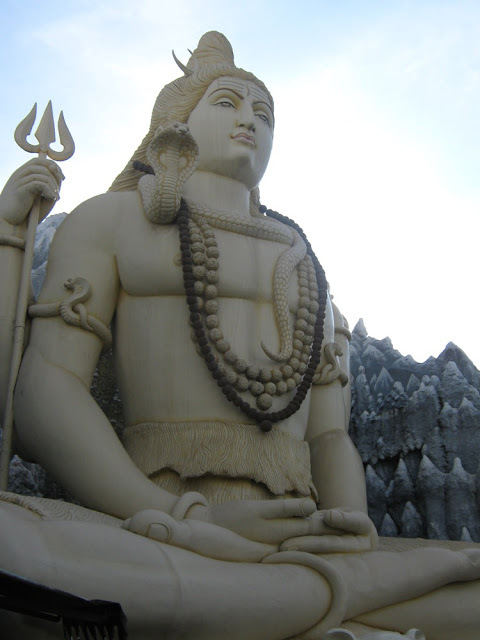 He argues that bringing rain, sunlight and wind was Indra’s duty as King of Heaven. As a kid, I was happy that, during the third day of Deepavali, we worshipped our lovable cow Kamadhenu, at home. When I asked my mother or Ajji why we did so, she would tell me how useful she was to us. Of course milk is the product that comes to our mind always first and from it we prepare curds, butter, ghee and paneer. Few years back the cow dung was used as a coating over the mud in our front yard before cement replaced them. Cakes made from cow dung were used as fuel to heat water in most of the homes until boilers replaced them and they are still used as best manure for plants. Go-Mutra (Urine) is used in every Homa (Sacrificial rites) and it plays a key role in ayurvedic medicines. Not only cow, rat is considered Ganesha’s vahana (Vehicle); as Garuda is of Vishnu’s; as Lion and Tiger of Durga’s; Peacock is of Subramanya’s and so on. Tulsi is auspicious and medicinal; similarly many other trees are worshipped; mountains are sacred as they are abode to several natural resources. Wells and Rivers are worshipped as they give life to us and then there is rain, sun etc; everything that is nature. Mother earth is worshipped before laying any foundation to show our gratitude towards her, as we alter her form and we seek her support. But out of all scientific or emotional reasons and justifications we may give, The Bagavath Geetha gives most beautiful explanation for this. Krishna says – If man does not perform sacrifice, if he does not respect the creator and creation, he will be defeated by his senses, his ego and he will act as his sense will ask him to. Sacrifice is a way to control your senses; his ego; his desires; his greed. Darwin might have found the reason behind survival of fittest in the 19th century but our scholars, thousands of years before, have not only found the reason but also have provided a solution to respect and preserve every creation or as in Darwin’s term, result of Evolution. Next day, we had 10 point tour around Gangtok. 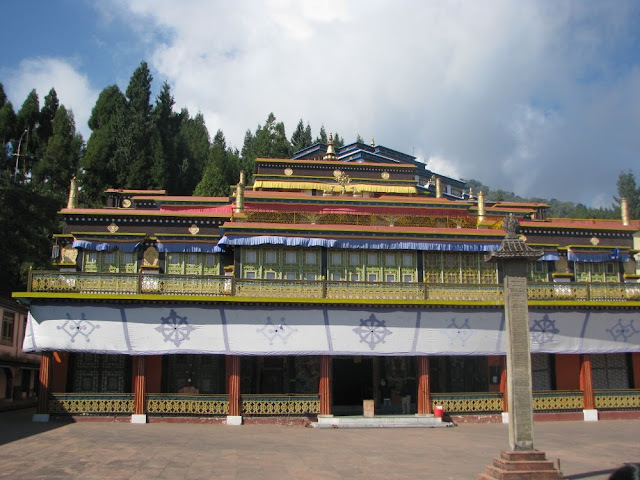 We first went to beautiful Rumtek Monastery. Here a nice unexpected experience happened.While walking through the Nalanda University there, I got to know that the students had just completed their exams and are having a sports day and picnic today, few distance up the hill, behind the monastery. I was very interested to visit them and one of the monks, led us there. 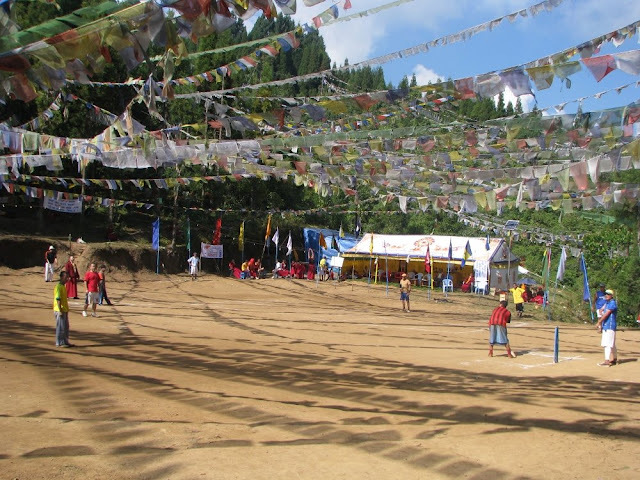 After a climb for around 10 minutes, we reached a flat land, where the monks had created a play ground and were playing cricket. As we were the only visitors, we were asked to sit in the main podium like some chief guests. We were served tea and biscuits. Our pictures were taken by the monks as if we were guests of honor. They name their cricket teams with name of countries. On this day, team “India” and “Australia” were playing. I spoke to an English teacher and a senior student. 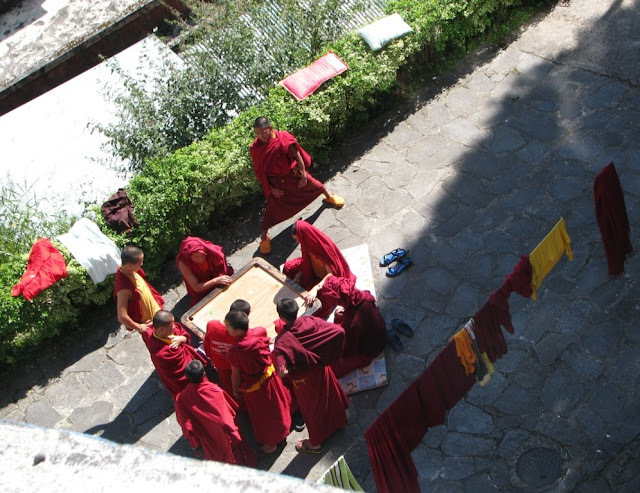 They told me that monks come here at a young age and they study for 11 years. After which they can choose to be in a monastery, or pursue higher education or penance. There are also some who abandon the studies and return back. The choice is left to the individual. We thanked all the monks and left. We next stopped at Nehru Botanical garden, whose plants in the green house where all dried. Girls from a convent where having a picnic there and in smaller groups had occupied different spots. We had a small chat with their teacher, a nun. 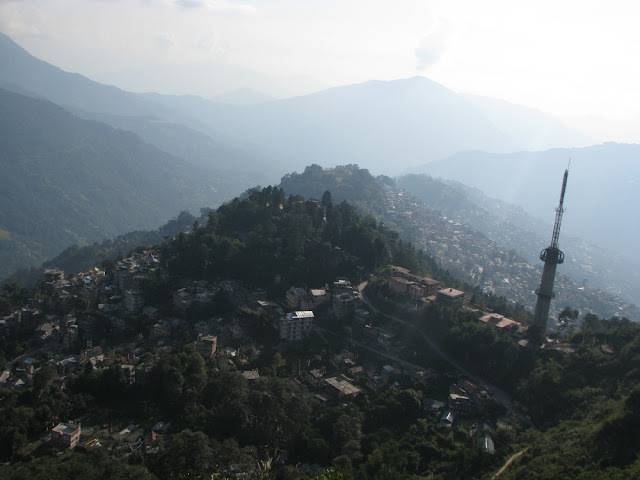 Several view points are famous in Gangtok and provide good picturesque view of the capital. Shanthi view point, Tashi view point, Ganesh Tok, Hanuman Tok (With Ganesha and Hanuman temples) Provide good view of KCD. We had a small stop at Govt institute of Cottage industry where many Sikkimese arts and crafts were on sale. A museum in front of the office is a nice place to know about the Sikkim culture. Flower garden has some good collections of orchids and asters. 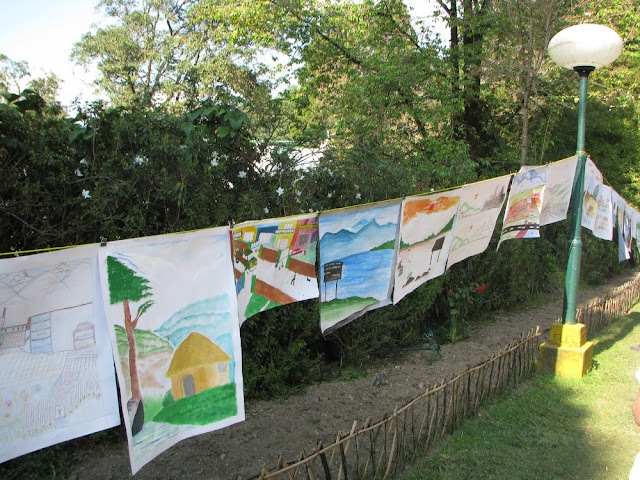 At a park nearby, school kids were having childrens day celebration with painting competition. 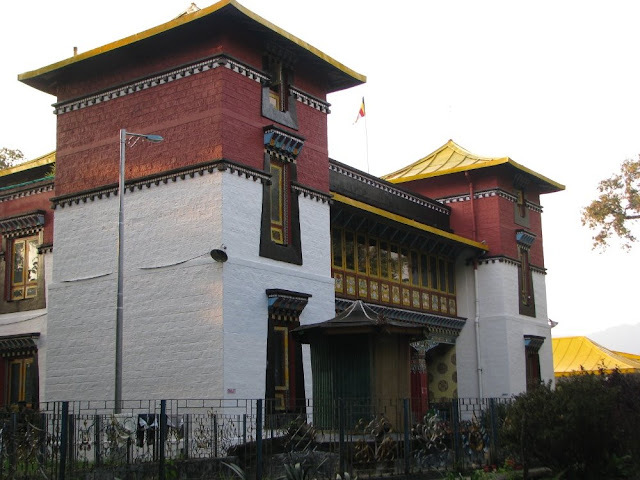 We next stopped at Tibetology museum which has a lot of interesting things from ancient Sikkim and Buddhism. A big Stupa with 108 prayer bells around is another attraction nearby. It is called Dodurl Chorten. 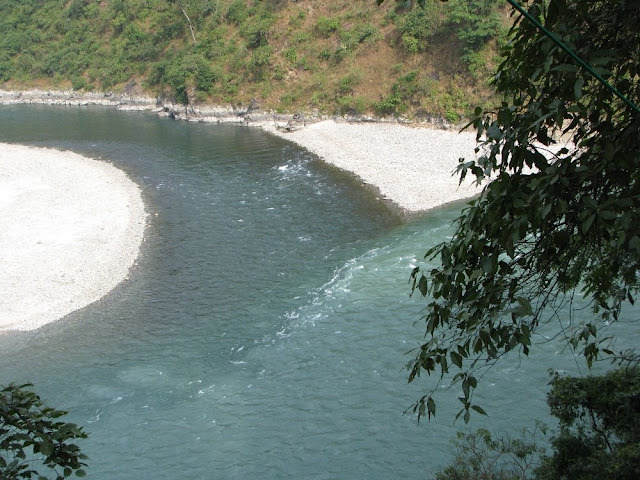 Next morning, we left Gangtok early morning; on the way stopped at Meli to see the union of Rangit and Theestha River; reached busy Bagdogra airport. Our return journey was uneventful unlike the onward journey. Sikkim for several reasons will be the one among the most lovable journey of my life. Both P & I loved Sikkim not only because it was the first trip we had together, but also because it’s enchanting beauty, kind and beautiful people. P & I are already considering another trip there in near future.